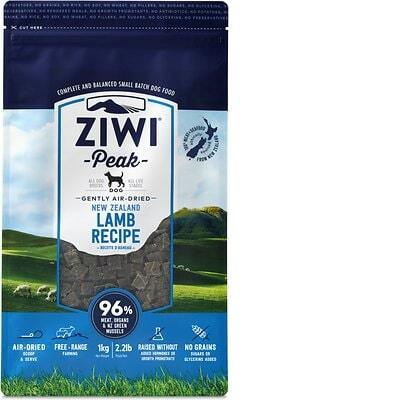 Ziwi Peak Air-Dried Lamb is a great quality dog food at a high price. This product has no controversial ingredients and zero artificial preservatives, colors or flavors. It has a relatively low amount of carbs compared to protein and fat and excellent quality meat and fat. Ziwi has a below-average number of recalls but was not very transparent when answering our questions. Overall, Watchdog Labs recommends this product. The average dog food we reviewed has 39 total ingredients, with 1 controversial ingredient. This product has 0 total controversial ingredients on the ingredients list. The heart is an organ that contains healthy nutrients like protein, vitamins and minerals. Lamb heart is generally a healthy dog food ingredient. Tripe is the edible lining of the stomach. While it may not sound appetizing to humans it's generally a healthy dog food ingredient. Raw tripe contains about 75% water which is cooked off during the making of dog food. This leaves only a fraction of the protein content in the final product's weight. So it's important that other protein sources (like meat meals) are present in the dog food. Lamb liver is an organ that contains healthy nutrients like calories, protein, vitamins and minerals. Specifically, it's rich in iron, copper, vitamin A and B. We consider it a high-quality dog food ingredient. The kidney is an organ that contains healthy nutrients like protein, vitamins and minerals. Lamb kidney is generally a healthy dog food ingredient. Zero controversial ingredients in this dog food, very good. Ziwi Peak Air-Dried Lamb Dog Food is made in New Zealand. We recommend buying products manufactured in the USA, Europe, Australia and New Zealand, because of the stricter food safety laws in these regions and countries. This food is very clear about which animals its meat ingredients come from. On the label we see Lamb, Lamb Heart, Lamb Tripe, Lamb Liver, Lamb Kidney, Lamb Lung, and New Zealand Green Mussel - all of them transparently show the species they’re sourced from. There are no added oils, so the fats in the food come from the included animal and plant ingredients. Ziwi Peak Air-Dried Lamb Dog Food uses no artificial colors. That’s how it should be! Just like for artificial preservatives and colors, this product does great when it comes to artificial flavors. That means it doesn’t include them at all. Fantastic! Ziwi Dog Food has a below-average number of recalls, compared to other brands we evaluated. Ziwi did not respond to the first or second email. A call was placed and the representative suggested that we consult their websites FAQ, and if the information was not found on the website then it’s because it’s not public information. Info was not found on their website. Info was not found on the website. Ziwi products are sourced and manufactured in New Zealand; and exported to over 19 countries. Because of our robust offering around the world, it is imperative that we exceed all international quality standards. Organizations who have certified our products include, but aren’t limited to, the following: New Zealand Ministry for Primary Industries, AAFCO, U.S. Food and Drug Administration, European Union, Japan, and Australia. Info was not clearly stated on their website. Ziwi Peak does not and will not source any of our ingredients from China.